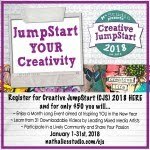 Remember the circle journal I'm participating in? Well it was time to create two pages in Susan Jane's journal. Susan asked us to use trees as our inspiration. It just so happens that I recently created a stencil with trees, at the request of Stencil Girl creative team member Judy Shea. 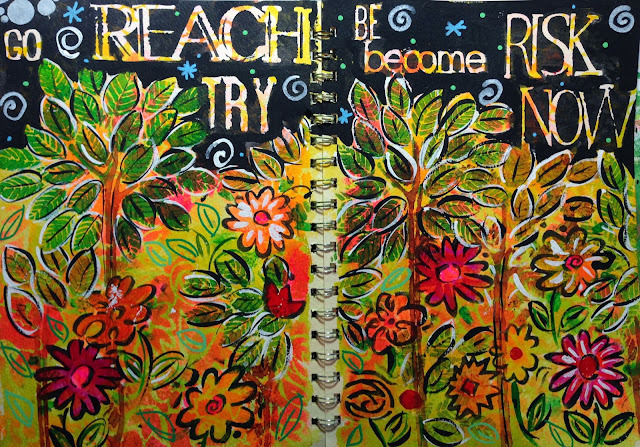 I used it, and my two newest flower stencils, plus Carolyn Dube's "Use Your Words" stencil, to make this spread in Susan Jane's journal. Here are the 4 new stencils! There are more pictures and a description of my process on Stencil Girl Talk today. Hope you'll check it out. Unfortunately, my filming cut off when I was creating the top of my page, using Carolyn Dube's "Use Your Words" stencil. You can see the technique here, on Carolyn's blog. 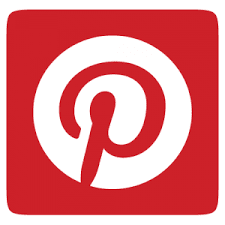 I hope you'll visit at Stencil Girl Talk! And I hope Susan Jane is happy with these pages in her journal; Tracy Woodsford - Susan Jane's journal is on its way to you! And there's a GIVEAWAY! Your comments make me so happy and let me know you were here. So I will giveaway all three of my new stencils - the two flowers and Judy's trees - to one randomly picked commenter! So please leave me a message by Wednesday at 7PM EST to be eligible to win! UPDATE: The winner is Linda of Artfully Yours! There's an email on the way and the stencils will be in the mail as soon as I get her address. It's a beautiful page Jessica, I love the color combination of the flowers and trees! Great stencils. Love how you used them. The stencils are great - all of them - what great designs!? And I love your spread - gorgeous! so much color in one place. great use of the stencils. love it! I love your pages Jessica and I'm sure Susan will too! These would be such a useful set of stencils. Luv them all! Gorgeous vibrant spread Jessica, what a fab way to show off those beautiful stencils. Oh, that tree stencil is really calling me. I know I'm going to have to have it and Carolyn's words. You have such beautiful art journal pages. They are so happy and joyful. I would be honored to win the stencils. what a stunning and glorious spread Jessica-I am blown away!! This would make a fabulous poster you know :) I so love how that gorgeous vibrant forest and words just pop off the wondrous starlit sky. Thanks for the chance to win these amazing stencils! 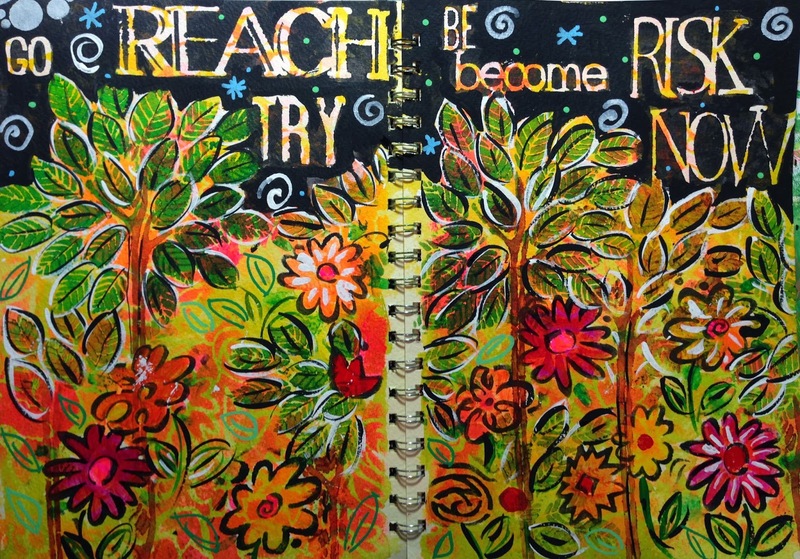 This is such a vibrant journal spread! 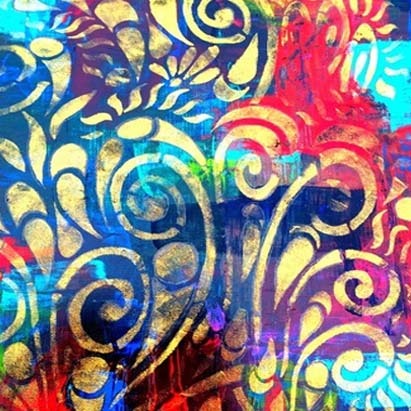 I love how you have used elements from all the stencils to create a beautiful composition! Thank you for sharing your process - always fascinating to me. I would love to have these stencils. Thanks for the giveaway opportunity. Well, I think this is one of my favorite pages of yours. I need to get your new flowers stencils the neg and the pos. I was going to order, but I will keep my fingers crossed that I win them. I love your work. You are so inspiring! Awesome as usual, Jessica! Love your vibrant pages. Great new stencils! What beautiful pages! The colors are so bright and cheerful! I think Susan Jane will be very pleased with these pages! Thanks for sharing and for the chance to win all three stencils! Hi Linda - You are the winner! Just sent you an email for your snail mail address! Loved the video, Jessica! I love the process of your work *almost* as much as the art! Well choreographed! Love what you did! Great video too! Thanks for the giveaway. I love seeing how to use stencils in different ways. Thanks so much for the video....and for the chance to win the stencils. Thanks for using the two flower stencils together. That was really helpful. Those are some of the greatest stencils - both positive and negative. I can't tell you how wide my grin was when I saw them. A must have for me. I love your artwork. You make it look so achievable. Your style and talent is much appreciated. I have Carolyn's stencil already from her Stencil Play workshop. You ladies really make my day. Thanks for the opportunity to win some amazing stencils. I love stencils! What you've done with them here is just swell! Thanks for the inspiration! great demo thanks for sharing it. I'm pretty new to Stencil Girl, but I love stencils and I am LOVING these, especially those great trees! Thanks for the chance to win! Love the pages. Great colors (my favorites). Thanks for making the video. Wonderful! I love working with tree shapes, so I'm very excited to see your new stencils. Thank you! Your page is gorgeous. 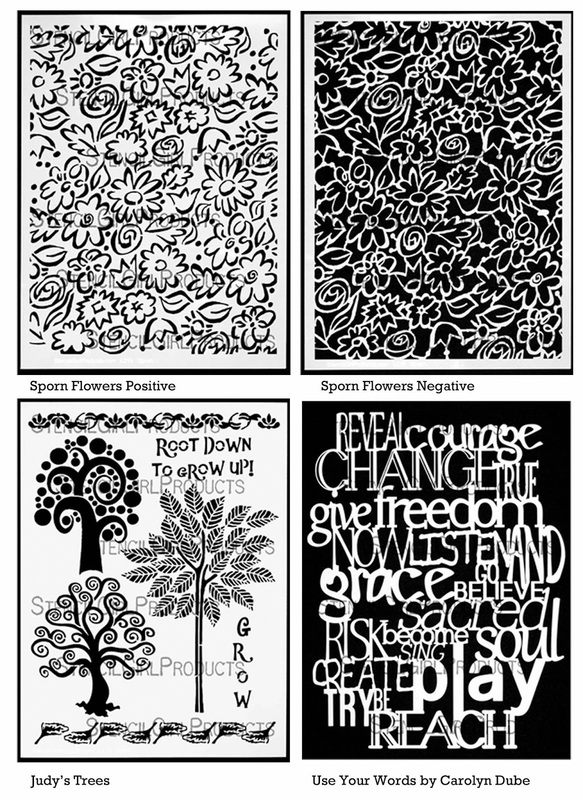 I *so* love the idea of the flowers stencils both negative and positive. Fabulous idea. Thanks for the chance to win. I love the trees stencil. Lots of inspiration as always! Thanks Jessica! I love all your art work :) and these stencils are awesome! Thanks for all the inspiration! I never know where to start with my journal pages! Love the inspiration here! Would love to win! Love it! Must get some of those stencils! If I don't win, I'll just have to buy some! Thanks so much for sharing! I love how you can use a variety of stencil and layer all the colors and make something so beautiful and completely original! What an amazing spread! Thanks for sharing how you did it. The stencils are great! I really love the way you used the stencils in this tutorial. Amazing colors too! I love all of the stencils, but I especially love the trees! The mix of media that you used in the journal pages was awesome! This is a beautiful page. I love how you used the positive and negative stencils -- gave me great ideas and inspiration!! Love the hand-drawn feel your stencils give ... beautiful! This is such a gorgeous spread ~ I really love the black sky/background behind your vivid scene.... and bold words. Stunning! Ooooh...love seeing the creative process!! So inspiring. What a stunningly beautiful result. LOVE the colors!!! How lovely of you to give us a chance to win these amazing stencils. I am just beginning to get into this exciting kind of art and these would be wonderful additions to my supplies. You did not require us to be followers in order to be eligible for your for your drawing (which I GREATLY appreciate), but I am a brand-new follower of yours by Google Friend, nonetheless. Yippee!!! 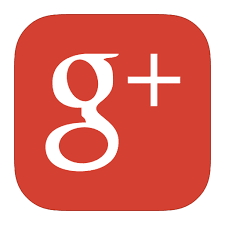 Thanks for sharing this - I am always wanting to learn more and your blog and ideas are great! I'm new to stenciling but - wow - the sky's the limit! I just got Carolyn's stencil; thanks for the inspirations! Love the way you highlighted those words that had meaning to you in that moment. Your videos are all inspiring. It is amazing what you can do with a stencil! I haven't yet found Stencil Girl stencils here in Alberta, Canada. Hope to soon though!